Known for his beach scenes and paintings of people enjoying themselves by the sea, On the Beach shows a beautiful vista populated with cheerful holidaymakers. In the distance, riders are seen on the water’s edge intermingling with the happy children. 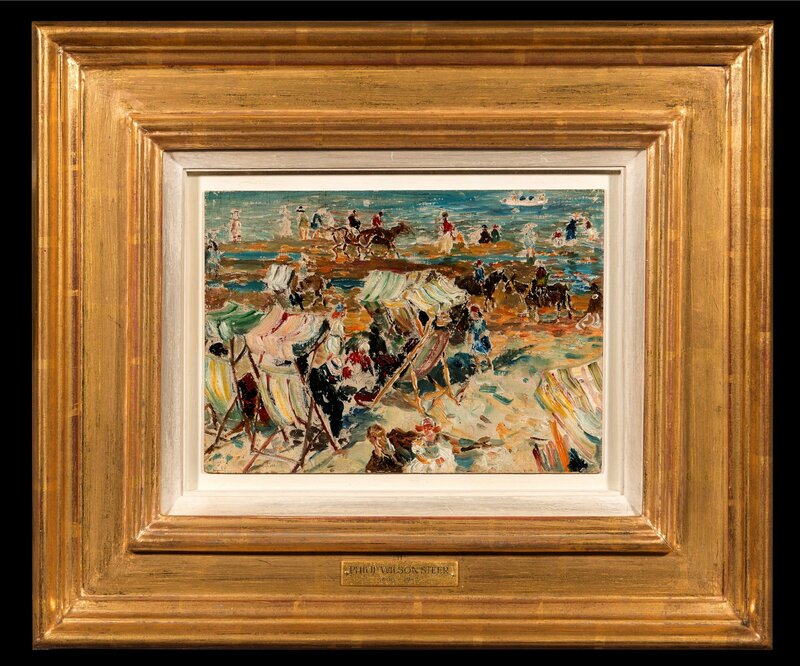 The striped awning of the deckchairs are brightly depicted using spontaneous thick brushstrokes whilst a similar technique is used throughout to evoke the mood of a bright summer’s day on the beach. Steer spent several summers on the Suffollk coast at Walberswick and Southwold painting landscapes such as these. He made rough notes on the spot in sketchbooks, and then, in the studio, made designs for a series of paintings. These were most original in their dislocation of the figures, and their shorthand sketchy outlines. The colours have a luminosity that surpassed even the Impressionist paintings that Steer had seen when he had studied in Paris in the 1880s. Unlike his French contemporaries these works were finished in a studio and most of them took several years to complete. However this influence of the Impressionist saw Steer, after his return from Paris in 1884, paint a series of shimmering and brightly coloured coastal views similar to those of Monet’s from the same period. The free brushwork and brilliant colours capture the transience and joy of childhood and summer vacations. His use of strongly contrasting colours also drew on theories being promoted by the most avant-garde painters in France at this time. Philip Wilson Steer was first trained at the Gloucester School of Art and later went on to study in Paris at Julian’s under the Salon painter Bouguereau and at the École des Beaux-Arts. Strangely he did not seem to come into contact with the work of the Impressionists until his return to London in July 1883 when Dowdeswell’s held a major exhibition. In the following year he returned to England and thereafter divided his time between his London studio and frequent trips to the France and areas of Britain, one of his frequent and favourite haunts being the coast of Norfolk. He developed a very spontaneous style making small, lively, plein-air sketches which would later be used as studies towards his larger studio canvases. His early impressionist-influenced land and seascapes, which are generally now considered to be his best works, were initially considered avant-garde and failed to find favour with the artistic establishment. As a result he became a founder member of the New English Art Club in 1886 and continued to exhibit there for nearly fifty years.